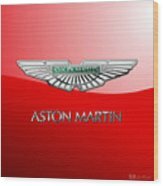 There are no comments for Aston Martin - 3 D Badge On Red. Click here to post the first comment. Introducing the �Wheels of Fortune� collection by Serge Averbukh, showcasing digital paintings of some of the coolest and most sought after automobiles of past and present along with amazingly digitally crafted car makers� insignia and badges (logos). 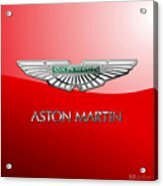 Here you will find framed and wrapped/stretched canvas fine art prints, featuring Aston Martin - 3D Badge on Red. 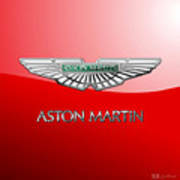 Aston Martin Lagonda Limited is a English manufacturer of luxury sports cars. It was founded in 1913 by Lionel Martin and Robert Bamford. 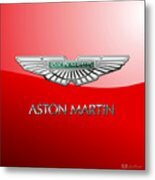 From 1994 until 2007, Aston Martin was a wholly owned subsidiary of the Ford Motor Company, becoming part of Ford's Premier Automotive Group when it was formed in 2000. In March 2007, a consortium of investors led by Prodrive boss David Richards purchased 90% of Aston Martin for �479 million, with Ford retaining a �40 million stake. 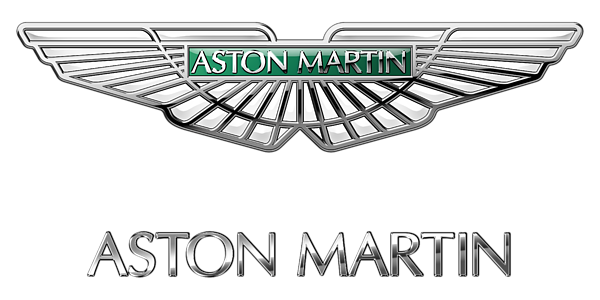 In December 2012, the Italian private equity fund Investindustrial signed a deal to buy 37.5% of Aston Martin, investing �150 million as a capital increase.